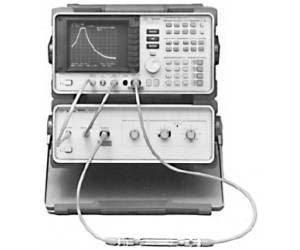 The Agilent 85640A is a MIL-Rugged portable tracking generator to be used with the Agilent 8560A, 8561A/B, or 8562A/B portable spectrum analyzer. Combining the Agilent 85640A tracking generator with a portable spectrum analyzer results in a system having both scalar-analysis and spectrum-analysis capabilities. Use the scalar-analysis capability to perform measurements such as gain, frequency reponse, compression, flatness, and return loss on components and subsystems. Use the spectrum analysis capability to measure harmonic and inter-modulation distortion, as well as spurious products.